If you don't have one of the Wacom serial devices, you probably don't need to worry about the below. If you do, read on. Wacom serial devices are supported by the xf86-input-wacom driver directly, but a much nicer way is to have the kernel deal with it and thus the device exposed as a normal evdev device to userspace. This way, the device is also picked up by libwacom and, in turn, by the GNOME Wacom panel for configuration and calibration. For the device to work as evdev device you need inputattach (in the linuxconsoletools package on Fedora). but of course we want to automate this. We used to have a udev rule that fires up inputattach but recent changes  in udev broke that ability: udev is now decidedly for short-running processes only, long-running processes started by a udev rule will be killed. The solution to that is a udev rule paired with a systemd service. and of course the information is available in the journal, etc. wacom-inputattach@ttyS0.service - "inputattach for Wacom ISDv4-compatible serial devices"
I guess about 80% of the time coding is spent handling error messages and dealing with the situation where the input isn't what it should be. That's ok for a real project, but sometimes it's just easier to say "this shouldn't happen but make sure I see an error if it does". For example when prototyping, it's enough to know that something went wrong so we can throw out the output. Or get notified when a value that should be within a range is outside that range, etc. The traditional way of that is assert(3), which checks an expression and aborts the program when the condition is not met. That is a heavy hammer, and not flexible enough in many cases. So not only does it give us the actual values, it also provides the symbolic names (if there are any). Which, for debugging purposes, makes the whole thing quite useful. And we don't need to double-evaluate, we can use the macro as condition. argcheck takes care to only evaluates its arguments once, so there shouldn't be any side-effects. This also goes for disabling argcheck. If ARGCHECK_DISABLE_LOGGING is defined when including argcheck.h no messages are logged but the conditions still exist and the code runs as before. The same goes for a user-defined argcheck_log function (in case you need to override the default fprintf(stderr)). argcheck_str_max_len(str, len) - false if the string is NULL, or longer than len. Works great to warn about truncated string copies. argcheck_ptr_null(ptr) - false if the pointer is not NULL. Works great to spot uninitialized variables. No, don't worry, evtest isn't actually dead. I'll keep maintaining it (it's not a lot of work, after all). But I'll discourage its use and in the future you should be using evemu instead. evtest is a tool that prints out a human-readable description of an evdev kernel device and its events. evemu does the same, but it also records the events in a format that can be parsed and re-played easily on another machine, making it possible to reproduce bugs easily. evemu was originally written by Henrik Rydberg, had a stint on launchpad and moved to freedesktop.org earlier this year. Since then, Benjamin Tissoires and I have been working quite a bit on it, trying to make improve on the usability. We're still polishing a few things, but since version 1.1 we have a UI that I'm now reasonably happy with it. And Benjamin we just released 1.2.
evemu has two modes: recording mode and replaying mode. In recording mode, evemu records the bits that the kernel exports for a device and writes them into a file. This includes both the device description and the events (if any) from the device. In replaying mode, evemu creates a virtual (uinput) device that looks exactly the same as the original file  and replays the events in the same order and timeframe. The result is that if you record your device and send it to me, chances are I can reproduce the bug without having the hardware. And of course, for the nastier bugs having a recording that reliably reproduces something is great for testing. Let's look at it in more detail. The first step for a reporter is evemu-record . This is obviously the list of devices on my machine, selecting a number will record that device (e.g. 4 will start recording the touchpad). Recording the output produces a bunch of comments describing the device in human-readable form, followed by the bits that we use within evemu. With the bits we need to replay on the left, and comments for humans on the right. To replay a device, you'll need two tools: evemu-device and evemu-play. The former creates a device based on the device description. The latter pumps the events into the newly created device. And that's it. You've created a new device and that device now spits out the events as recorded. evemu-play will replay the events so that the timing is as close as possible to the original recording, meaning that you can reproduce most bugs. Speaking of bugs: if you have an input-related bug that is triggered by a given event sequence, record your device. Make sure the recording reproduces the bug and attach the file to the bugreport. I almost always ask for an evemu recording anyway, so having that ready just speeds up the process. Ich hab's zuerst nicht bemerkt, darum kommt diese Warnung etwas spät. Dennoch: seit Fedora 19 (xkeyboard-config 2.8) gibt es eine kleine Änderung im deutschen Tastaturlayout. Die Tilde taste ("~"), zu finden neben der Entertaste, betätigt mit AltGr und "+" war ein sogenannter dead key. Solche dead keys ermöglichen es mit mehreren Eingaben Buchstaben wie etwa "ñ" zu erzeugen (tilde + n). dead key hieß allerdings auch dass, um eine tatsächliche Tilde einzugeben, "~", die Taste zweimal betätigt werden musste. Dieses Layout war anders als die DIN und das Standardlayout in Windows und wurde daher geändert. Siehe (fdo bug 9753). Die neue Belegung ist Tilde, ohne dead key Funktionalität. Falls das alte Layout bevorzugt wird, muss das Layout auf Deutsch(veraltet) gestellt werden. Dies kann entweder über setxkbmap -layout "de(legacy)" bzw. setxkbmap -layout "de" -variant "legacy" geändert werden, bzw in GNOME über eine etwas versteckte Option. Im "Region und Sprache" Dialog den "+" Button betätigen, danach die drei vertikalen Punkte anklicken. Das öffnet das Suchfenster, wo dann nach Deutsch(veraltet) gesucht werden kann. Diesen Eintrag wählen und fertig. Ok, I'm a bit late here because I didn't notice and apparently most Fedora users with a German keyboard layout didn't either. 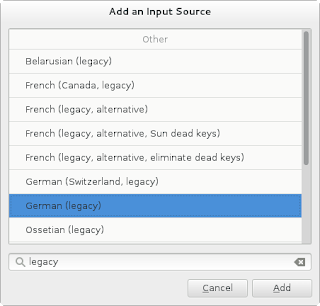 Nevertheless, a PSA: the keyboard has changed upstream in version 2.8 which is the one we're shipping in Fedora 19 and thus later versions as well. The tilde "~" key, on AltGr and the + key, left of the Enter key, used to be a dead key. Dead keys allow multi-key combinations. In this specific case the dead key tilde followed by n would produce ñ. It also means that to type an actual "~" the tilde key had to be typed twice. This layout was against the DIN norm and differed from the default Windows layout too, so it was changed to a normal tilde (see fdo bug 9753, opened in 2007!). 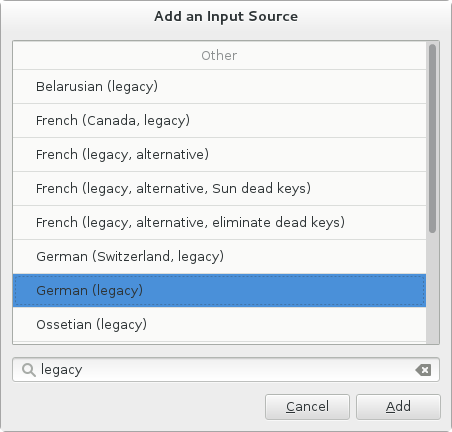 If you prefer the old workings, you'll need to switch to the German(legacy) variant. If you configure with setxkbmap, simply use setxkbmap -layout "de(legacy)" or setxkbmap -layout "de" -variant "legacy". 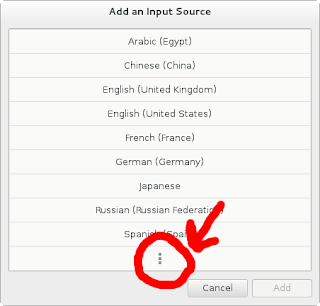 If you're using GNOME, the configuration is a little hidden. Fire up the "Region & Language" dialog in the control center ("Region und Sprache"), hit the little + button and then the three vertical dots which open up the search field. Search for "legacy" and you'll see German(legacy) pop up. Select it and you're good to go. If you have your desktop in German, the entry to search for "Deutsch (veraltet)". I'm using a lot of branches. Almost one per feature or bug, and they add up quickly. Why I'm doing this doesn't matter for this post, but I found it to be a good workflow. The problem with that is of course that after a while I forget which branch was for what, or what branch I worked on three weeks ago. So I started hacking up some git helpers. I pushed them to https://github.com/whot/git-branch-tools today, feel free to use them or improve on them. Some branches are not actively developed anymore but should still be preserved for posterity. These branches are clogging up the branch view. Working on many branches can mean you forget which branch you worked on last week, or the week before. The output above shows the branch name, last time that branch was checked out, last commit time and a marker that shows up if this branch doesn't exist anymore. There are a few more flags you can pass in too, including git log flags, so play around with it. And install the git-post-checkout-nagging-hook as your .git/hooks/post-checkout to make sure you get reminded to set the branch description. So you thought moving a pointer/cursor on-screen is simple? Well... no. Having recently spent a day fixing up freedesktop Bug 31636, I figured maybe I should take you on a journey that starts with naïveté and ends in insanity. Just like Twilight. What is actually needed to move a pointer on the screen? Move your mouse. The driver submits two relative coordinates to the server and expects the pointer to move. So we take the coordinates, add it to the last known coordinates and we're done. A 1:1 movement of course only works for slow mouse movements. For larger deltas, we need to accelerate the pointer movement so we can easily cover larger distances on the screen. So we look at the timestamps of the events, their delta movements and use that to calculate some factor. This factor is applied to the latest deltas and then decides the actual movement. Now we've pretty much covered traditional mice. Many devices however are absolute input devices. They don't use delta coordinates, they just give us the absolute position of the pointer. However, that position is not in pixels but some device coordinate system. So we need to remember the axis ranges and scale from the device coordinate system into the screen coordinate system. Many users have more than one screen. Two or more screens, when not in mirrored mode, create a desktop that is larger than each single screen. For absolute devices, we map the device to the desktop coordinates so that each edge of the device maps to the corresponding edge on the desktop. Absolute events from such a device must be first mapped to desktop coordinates. From those coordinates we can gather the screen the pointer is to be on and clip the coordinates back to the per-screen coordinates to draw the visible cursor. For relative devices the process is somewhat similar, we add movement to the desktop coordinates, then clip back to per-screen for updates. All of the above is pretty standard and doesn't require any X specifics. Let's get into what the X11 protocol requires. evdev has a calibration feature that allows a device to be adjusted for differences in the actual vs. announced coordinates. This is needed when a device real axis ranges are actually different to what the device announces. For example, a device may claim that the axis starts at 0, but really the first value you get out of it is e.g. 50. For historical reasons we cannot change the device axes once they are set up though. So evdev's calibration scales from the calibrated device range (e.g. 50-950) into the actual announced device range (0-1000). That scaled coordinate is then posted to the server. The wacom driver has a similar feature (called Area). The bug that triggered this blog post was an actual use-case. If an absolute device is used in relative mode, the coordinates were still applied according to the device coordinate range. Thus, relative motion on the device was dependent on the desktop dimensions and attaching a second monitor would increase movement in one axes but not the other. To avoid this, we have an extra layer of scaling, where we pre-scale the coordinates first. That scaling is then undone by the second conversion into desktop coordinates. Whoopee. Posting this here too to get a bit more exposure. XIQueryVersion(3) is the first XI2 request clients should send to the server. The client announces its supported version and in return receives the server version (which is always less or equal to the client, never higher). XIQueryPointer will not set the button 1 mask for pointer-emulated events if the client supports XI 2.2 or newer. XIAllowEvents will allow XIRejectTouch and XIAcceptTouch for clients supporting XI 2.2 or newer. Raw event delivery changes if a client supports XI 2.1 or newer. The client can issue multiple XIQueryVersion requests, but they need to have the same version numbers to provide for consistent server behaviour. So far, so good. This works fine as long as the client supports one specific version. However, as toolkits like GTK have come to support XI2, the requirements changed a bit. An application and its toolkit usually look like a single client to the server. However, the client may support XI 2.0, but the toolkit may support XI 2.3. And neither knows of the other's version support. If the client requests XIQueryVersion before the toolkit, the toolkit is locked into the client version. But if the toolkit first requests XIQueryVersion, the client is locked into the version supported by the toolkit. Worst case the client may get a BadValue and quit because it may not be built for this case. Jasper St. Pierre and Owen Taylor brought this up on #xorg-devel today, and I've send a proposed solution to the mailing list. A new XIGetSupportedVersion request simply returns the server's major/minor version number. Uncapped, so really what the server supports. And the same request also returns the client version previously announced with XIQueryVersion. Or zero, if the client hasn't called it yet. This request enables toolkits to query what the client has already set, and of course what the server supports without modifying the client state. The request is currently an RFC, but I do hope we may get this into XI 2.3. If you're working on XI2-aware clients or toolkits and you have a use-case that requires this or would break by this addition, please speak up now. In some error cases, GNOME will display a full-screen window with only a single button. The window claims that "Oh no! Something has gone wrong." and "A problem has occurred and the system can't recover. Please log out and try again." The button merely allows a user to log-out and thus quit the current session. Killing that window with xkill also quits the session. Most of the crashes I get is from experimental code crashing gnome-settings-daemon. Certainly not something fatal, certainly not something that should prevent me from continuing to work in my current session. After all, the menu key still works, the hot corner works, everything works, but closing the dialog will throw me out of my session. And because that pesky dialog is always on-top, I'm down to one monitor. Luckily, the dialog can be disabled. The dialog is displayed by gnome-session and it's named the fail whale (code). It's triggered only for required apps and those can be configured. Drop g-s-d from the required components, restart the session, and you won't see the error anymore. Try it by sending SIGABRT to g-s-d. Doing so twice (g-s-d restarts once) will trigger the error unless g-s-d is dropped from the required components. It should go without saying, but the above will only display the error message, it won't fix the actual error that causes the message to be displayed.